Beautiful luggage! I used 2 of the 3 on a trip to Jamaica on March. Held up nicely! 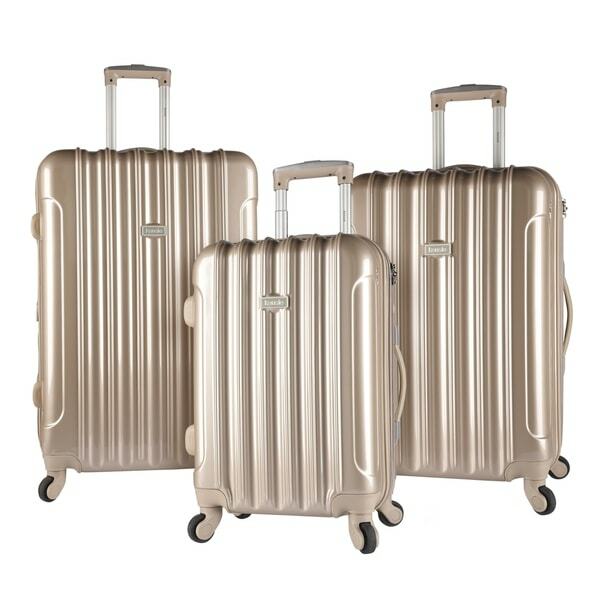 Travel in style with this three-piece luggage set. Available in a sleek pink, gold, or silver, the hardsided construction offers durable protection for your gear, and the spacious, fully lined interiors offer plenty of space for your items. Elastic tie-down straps, a zip-around divider, and a large zippered mesh accessory pocket help keep you organized. Retractable handles and spinner wheels provide easy maneuverability. At first when I opened the box, I was pretty disappointed. The color on the luggage was nothing like the pictures and it already appeared scratched. Then I noticed there was a slight piece of film coming off of one of the bags. I pulled on it, and an entire piece of film came off. Apparently you are supposed to remove all of the film, but there are no instructions with the bags, so I was not aware at first. It is not obvious at all. Once I got all of the film off, (which took forever!) the color on the bags are perfect! They look very quality and seem like they are durable too. The other thing that I was frustrated with was that there were also no instructions on how to unlock the 1st bag which was housing the other two. There was only one tag on the bag and it said nothing about unlocking it. So I had to call overstock customer service and get their help to open them. You have to set the code to "000" and then push up on the lower button. Obviously you wouldn't know that unless told. Once I got the 1st bag open, then I found the locking information inside the 2nd bag. So my only complaints was that the Kensie Brand did not provide instructions on how to unlock the bags, did not provide a key in case I would like to use that function, and no note was made about the film needing to be removed. But in regards to the luggage themselves, they seem great so far! :) Hopefully this review will help other people avoid the frustration I initially experienced. High quality and very durable. They wheel and glide very easily and hold a ton! I love this set. My husband and I travel on vacation every three months. This set is beautiful and easy to roll. It took me a minute to figure out how to open (you just slide the part that has a key opening). Better quality than my other set and its expandable. 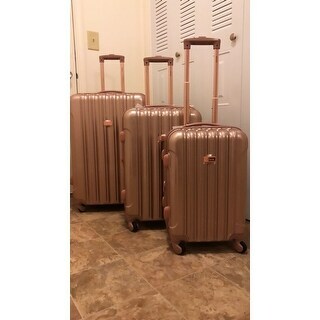 Luggage is extremely lightweight and the color is beautiful. Great bags! Went to England, Spain and France. Awesome Luggage Set! I ordered the silver set first and now I'm back ordering the Rose Gold or Pink set. Overall, good quality with style! Very nice! Rolls nicely with the spinner wheels. Has a beautiful color (daughter accidentally kept the protective film on it for a year wondering why it was "shedding" until we realized what it was). Holds a lot and it easy to organize. basically happy with the purchase except the key was not in the box. need to call to see what can be done about it. I will update my review after my daughter takes it to spain this summer. hope it travels well! I received my suitcase with no code or key to open it. Customer service never got back to me on how to open it. So now I have to return it, unfortunately. These suitcases scratch VERY easily. After my first trip they a lot of the Metallic finish had been scratched off. I understand that with travel your luggage can get scratched but i would think that the finish on these suitcases would be more durable to last at least a couple of travels. Zipper came apart on first trip. Luggage never left the trunk of our car! The color is a pretty rose gold. My girls love this set for their traveling needs. I love how light this set is. However, the wheels don’t roll as well as it had initially. We can not roll it upright as intended anymore because of the wheels. I have only had this set for a few months. 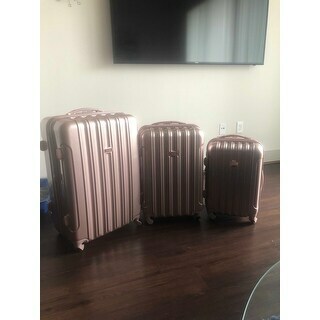 I was in need of a luggage set, So I purchased this luggage set in “pink” which looks rose gold and I am inloveee with it!!!! I’m even more excited now about my upcoming trips! Love, love, love...love the color, love the quality, love everything about this luggage. 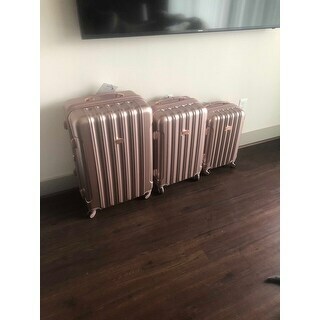 I’ve traveled with them 2 times already and they are comfortable to move and you can’t miss them on the luggage belt which is important. If your a rose gold lover like me I highly recommend this set. Extremely happy with the price. They are perfect. They look sturdy and so nice for the price. They held up well, since they were ni padding in the box, but overall, I would say that it's a great deal and I cannot wait to use them. I ordered on either a Sunday or Monday and received it that Friday. As soon as I took the film off I was in love with the color. I previously ordered the Kenneth Cole Out of Bounds in rosegold but it was brown so I had to send it back and I was charged to ship it back. So I saw this one I thought I’d rather have a pinkish rosegold than a brown rosegold. 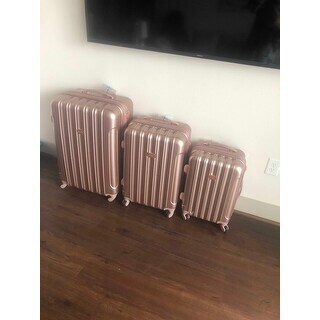 After taking each suitcase out I noticed that the medium one had scuffs and scratches on it, but I’m not sending it back because I don’t want to pay to ship it back and because I’ll be upset if they were sold out because the color is exactly what I was looking for. I can’t wait to travel with this set. By the touch I think that it’s bound to scratch and scuff all of the time but fingers crossed it doesn’t. I gave it four stars because of the scratches and scuffs on the medium one, but it gets five stars in being rose gold. These are tough and rugged travelers! France, Italy, and Spain! Perfect for any travel need. They did a great job of protecting my belongings. This set is beautiful and I love it! "Do you sell single piece? I need only the medium size of golden colour"
This is only sold as a set. "What is the actual size of the carry on. Does it meet 21” international requirements. " Dimensions: Small: 20 inches high x 14 inches wide x 10 inches deep, 7 pounds. Medium: 24 inches high x 16 inches wide x 12 inches deep, 9 pounds. Large: 28 inches high x 19 inches wide x 13 inches deep, 12 pounds. "When will the pale gold be available?" "Do you plan on getting the gold color shown in stock anytime soon?" We hope to have these back in stock around Nonmember. "When will be the rose gold restocked?do you sail them at some shop from Houston - Texas"
"I wanna choose the rose colour but it isn't on the option !!! !can you tell me if there are ?" "I have questions about the warning sign. Exposure to BPA"